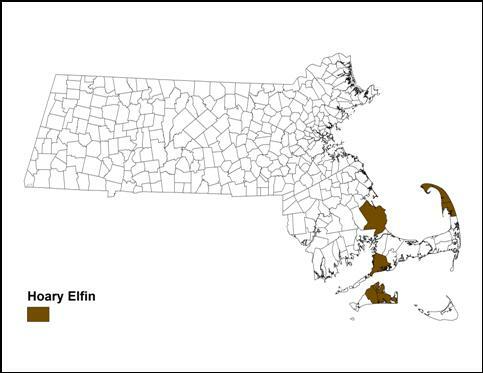 Of the four Deciduphagus (deciduous-feeding) elfins in Massachusetts ---Hoary Elfin, Brown Elfin, Frosted Elfin, and Henry’s Elfin--- Hoary Elfin is the most habitat-specialized and the most vulnerable to climate warming. This butterfly’s sole plant host is bearberry (Arctostaphylos uva-ursi), its range is mostly to our north, and it has apparently been extirpated from several states to our south, including Connecticut and Pennsylvania (O’Donnell et al. 2007; Cech 2005; Glassberg 1999). Hoary Elfin should be of conservation concern here. Hoary, Frosted, and Henry’s Elfins were confused by early lepidopterists, including Scudder. Hoary was finally established as a distinct species by Canadian entomologists in 1907. Its genus has been questioned. Kurt Johnson (1992) re-examined the elfins world-wide, dividing them into two groups based on larval host plants: the conifer-feeders and those that feed on deciduous trees and shrubs. He proposed that the genus name for the latter, which would include the bearberry-feeding Hoary Elfin, should be Deciduphagus, and that the older name Incisalia should be reserved for the pine- feeders such as the Eastern Pine and the Bog Elfin. The host plant distinction is supported by morphological differences. However, most lepidopterists still lump our elfins into the broader genus Callophrys, and that has remained the usage today (Pelham 2008; Kirk 2003). With the benefit of present-day knowledge, most museum specimens have now been re-classified to the right species, and it appears that there were several locations for Hoary Elfin in southeastern Massachusetts between 1900 and 1990. We have examined a large dataset of Massachusetts elfin specimens from major museums, including the Museum of Comparative Zoology (MCZ) at Harvard, the American Museum of Natural History (AMNH), the Smithsonian, the McGuire Center at University of Florida, Yale Peabody Museum, Boston University (BU), Cornell University, and University of New Hampshire (UNH). Also included are all Lepidopterists’ Society Season Summary and Correspondence (LSSSC) reports, supplied courtesy of Mark Mello. These data were compiled in 2010 by a lycaenid and climate change working group at Boston University led by Dr. Richard Primack, and were kindly made available by him. Museum specimens document several locations for Hoary Elfin between 1901 and 1990, but not as many locations as for Frosted Elfin. All specimens are from southeastern Massachusetts, with exception of a questionable one from Amherst. In the early 1900’s there are specimens from the towns of Falmouth (Waquoit Bay, 1933-1939) (BU, UNH, McGuire); Barnstable (1950) and Pembroke (1921) (MCZ); and Eastham (1930), Fall River (1935), and Chilmark (1937) (Yale). Between 1951 and 1990, there are specimens from Plymouth (1974, 1976) (MCZ, AMNH, Yale); and Wareham (1975, 1977) (Smithsonian, MCZ); as well as reports and specimens from Wellfleet (1977) and Truro (1983, 1986) (Mello records). The specimen from Martha’s Vineyard (May 7, 1937 Chilmark, L. W. Cleveland) at the Yale Peabody Museum is the earliest report of Hoary Elfin from that island, but the species is common there today and probably was in the past. Thus far, there appear to be no records at all for Nantucket (Kimball and Jones, 1943). The earliest report from the Myles Standish State Forest area in Plymouth appears to be in 1974, when lepidopterist Dave Winter found it on April 30, although there is a 1964 specimen from Carver High Street, C. N. Potter (McGuire). The earliest report from Wellfleet on Cape Cod appears to be 1976, when lepidopterist Deane Bowers saw it flying on May 5 (Lep. Soc. Seas. Sum. 1974, 1976). In Massachusetts today, Hoary Elfin is found only in Plymouth County, Cape Cod, and Martha’s Vineyard, according to both MBC and Atlas records. It is limited to dry sandy or rocky regions where the food plant, bearberry, grows. Bearberry (Arctostaphlos uva-ursi) is Hoary Elfin’s primary hostplant in Massachusetts and throughout its range. Larvae feed on the buds and flowers of the native bearberry, and adults use the flowers for nectar. In Canada, Pennsylvania, and Virginia eggs and larvae have also been reported on Trailing Arbutus (Epigaea repens), a similar ericaceous plant occurring in dry, rocky forests, and the butterfly has been successfully raised on that plant (Layberry et al. 1998). In the state forest on Martha’s Vineyard, Hoary Elfin has been seen nectaring on Epigaea, but not using it otherwise (M. Pelikan, pers. com. 8/7/2010). Hoary Elfin is very local, even more so than Frosted Elfin. It is restricted to sandplain or dry upland habitat, and is never found far from the host plant, although small patches of habitat may be occupied, and females in New Jersey are reported to disperse rather widely. Unlike Henry’s Elfin, the Hoary has not adopted any new non-native host plants. Presence of the hostplant does not, however, guarantee presence of the butterfly; on Martha’s Vineyard there are some extensive patches of bearberry where Hoary Elfin has been searched for, but not found. The 1986-90 MAS Atlas found Hoary Elfin in only five blocs out of 173 searched, making it a “Rare” species. Today we know that it is not rare; in fact, the number of MBC sightings would rank it as “Uncommon” (Table 5). It is not as frequently seen as Brown Elfin, but is about in the same frequency category as Henry’s Elfin, although more local and habitat-restricted. Overall no strong abundance trend is evident in Chart 25. In addition, for the years 1992-2010, a list-length study of these data reveals no significant increase or decrease in detection trend for Hoary Elfin (Breed et al. 2012). The numbers shown in the chart are almost wholly from two large locations, Myles Standish State Forest in Plymouth and Manuel Correllus State Forest on Martha’s Vineyard (detailed numbers shown below). The counts are by seasoned observers, but time, effort and distance are inadequately accounted for here. The yearly fluctuations seen in Chart 25 require some comment. The 1992 data consist mainly of a report of 27 from Myles Standish SF in Plymouth on 5/19/1992 by B. Cassie, but this excellent mid-flight report looms over-large because of the small number of total trips that year. From 1994 through 2003 there is an upward pattern, then a marked drop in 2004 and 2005 in both main locations, after which there was again an upward pattern, but one based almost solely on reports from Myles Standish SF. The 1986-90 Atlas found Hoary Elfin in five southeastern towns: Plymouth, Barnstable, Mashpee, Truro and Wellfleet. MBC has no subsequent reports for Barnstable or Mashpee. BOM-MBC 1992-2013 records for Hoary Elfin, shown in Map 25, come from ten towns; these are Plymouth and Carver; Falmouth; Wellfleet, Truro and Provincetown; and the four Martha’s Vineyard towns of Edgartown, Oak Bluffs, Tisbury and West Tisbury. The two premier locations for Hoary Elfin in Massachusetts are state forests. One is Myles Standish State Forest in Plymouth and Carver, visited in Hoary Elfin flight season every year 1992-1995, and 2003-2013 by MBC members. The highest count at Myles Standish prior to 2003 had been 27 on 5/19/1992 B. Cassie; subsequent high counts are shown in the table below. The peak count was in 2003, and while there was a noticeable decline in numbers seen in 2004 and 2005, numbers appear to have recovered, remaining between 15 and 25 in 2009 through 2013. The second main location is Manuel F. Correllus State Forest in West Tisbury and Edgartown on Martha’s Vineyard. Records for this colony begin in 1998, and are from regular observer Matt Pelikan. As at Myles Standish, the highest count was in 2003; prior to that, annual high numbers seen had been between 9 and 16 each year 1998-2002 except for 4 in 2000. Since 2003, numbers seen at Manuel Correllus SF have dropped dramatically. Despite visits, none were seen in 2004, and annual numbers have been between 1 and 5 each year through 2013 (see table below). Numbers appear to be getting perilously low at this site, possibly due to over-intensive management (see Outlook section below). On Cape Cod, reports are in small numbers from four towns. The highest counts have come from Pamet in Truro: 13 on 5/5/1997 J. Sones, and 6 on 5/14/2000 by B. Nikula. Wellfleet has been another productive location, the highest count being 5 reported from Wellfleet Bay WS on 4/22/2010 by M. Faherty. Mello and Hansen write that “the bearberry-clad hills from North Truro to Wellfleet are the primary haunts of this species (2004: 40).” Singles have also been reported a number of times from Crane WMA in Falmouth. NOTE TO COLLECTORS: SPECIMENS OF THIS SPECIES SHOULD NOT BE TAKEN EXCEPT AS PART OF A SCIENTIFIC RESEARCH PROJECT UNDER INSTITUTIONAL AUSPICES. COLLECTING IS NOT ALLOWED ON MASSACHUSETTS AUDUBON OR TRUSTEES OF RESERVATIONS PROPERTIES WITHOUT A PERMIT. Like all of our elfins, the Hoary is single-brooded, its annual flight occurring from mid-April to mid-June, according to MBC records (http://www.naba.org/chapters/nabambc/flight-dates-chart.asp). Earliest Sightings: : In the 23 years 1991-2013, the seven earliest "first sightings" are 4/4/2012 Martha's Vineyard Wasque Res.TTOR, R. Hopping; 4/10/2010 Plymouth/Carver Myles Standish SF, M. Arey; 4/12/1998, Oak Bluffs, M. Pelikan; 4/13/2000 Martha’s Vineyard, M. Pelikan; 4/14/2002 West Tisbury SF, M. Pelikan; 4/15/1999 Edgartown SF, M. Pelikan; and 4/17/2011 West Tisbury, M. Pelikan. In nine of the 23 years, the earliest sighting was before the third week in April (before 4/21). Latest Sightings: The four latest "last sighting" dates in this 23-year time period (1991-2013) are 6/6/1998 Tisbury, M. Pelikan; 6/1/2008 Plymouth Myles Standish SF, E. Nielsen; 5/28/2005 Plymouth, M. Mello; and 5/27/1997 Truro Pamet, J. Sones. Both the early and late MBC dates stretch beyond the period reported in the Atlas. Flight Advancement: The Polgar et al. 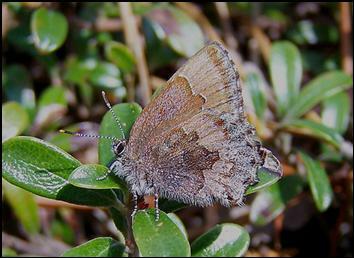 (2012) study of lycaenid flight times did not find significant flight time advancement for Hoary Elfin, perhaps because of the relatively small number of observations. However, newer calculations using similar methods with 1986-2012 data are showing that Hoary Elfin advanced its flight time between 12 and 16 days over this period (Williams et al. 2014). Although Hoary Elfin is apparently secure throughout most of Canada, that is not the case in New England. It ranks as possibly extirpated (SH) in New Hampshire, presumed extirpated (SX) in Connecticut, and critically imperilled (S1) in Rhode Island. In Massachusetts it is vulnerable (S3) (NatureServe 2010). The critical factor is the scarcity of dry upland or sandy plain habitat containing bearberry. In the case of this butterfly, the specificity of its single food plant defines and limits its distribution. In addition to habitat specialisation, Hoary Elfin, unlike Frosted Elfin, seems vulnerable to negative impact from climate warming. Its range could easily contract northward (Table 6). Hoary Elfin is found south of New England in only a few scattered places. In the Appalachians the Epigaea-feeding populations have recently been declining (e.g. critically imperilled or imperilled in Pennsylvania, Maryland, and Virginia; possibly extirpated in West Virginia). In New Jersey Hoary Elfin is found in the sandy pine barrens, where it is similarly ranked S3 or vulnerable. The range does not extend any further south (Cech 2004). Connecticut provides an uncomfortable example of how development (and possibly climate warming) can lead to the loss of this species. Although Hoary Elfin was formerly resident, with six records prior to the 1990-95 Atlas and at least one colony in the sandy pinelands along the eastern edge of the state, it was not found at all in the Atlas period. The last record was in 1960 from the sandy pinelands area. The Atlas concludes “The Hoary Elfin is apparently extirpated from Connecticut. The state has few large stands of Bearberry remaining. Like many of Connecticut’s other barrens butterflies, the Hoary Elfin suffered from loss of habitat due to development, succession, and fire suppression” (O’Donnell et al. 2007: 190). Hoary Elfin may also be impacted by over-intensive management of existing habitats. In Manuel Correllus State Forest on Martha’s Vineyard, there seems to have been a persistent decline in Hoary Elfin numbers after a peak in 2003 (see above). The decline coincided with a project to widen the fire lanes and mow them more frequently. Whether the decline is due to the heavy management, or is simply part of some expected population fluctuation, is not known, but regular observer Matt Pelikan hypothesizes that bearberry has not yet colonized the areas created by the widening (many of which are still covered with chipped wood), and that summer and autumn mowing is stressing the bearberry where it does exist and causing mortality of immature elfins (pers. com. 8/5/2010). The impact of management regimes on this and other sensitive butterfly species needs to be more carefully assessed. Hoary Elfin illustrates the necessity of paying attention to butterflies which are “uncommon” in our state. While not “rare,” certain sensitive species are monophageous, single-brooded, and dependent on a special type of habitat. A “watch list” of such species should be created, and populations carefully monitored.